CH3CHOHCO2H, a colorless liquid organic acid. It is miscible with water or ethanol. Lactic acid is a fermentation product of lactose (milk sugar); it is present in sour milk, koumiss, leban, yogurt, and cottage cheese. ..... Click the link for more information. . Alcoholic fermentation is a process that was known to antiquity. Before 2000 B.C. the Egyptians apparently knew that crushed fruits stored in a warm place would produce a substance with a pleasant intoxicating power. By 1500 B.C. the production of beer from germinating cereals (malt) and the preparation of wines from crushed grapes were established arts in most of the Middle East. Aristotle believed that grape juice was an infantile form of wine and that fermentation was, therefore, the maturation of the grape extract. Interest in the process of fermentation has continued through the ages, and much of modern biochemistry, especially enzyme studies, has emerged directly from early studies on the fermentation process. One of the earliest laboratories established for the study of biological chemistry was that founded in Copenhagen in 1875 and financed by the brewing family of Jacob Christian Jacobsen. the process of anaerobic decomposition of organic substances (primarily carbohydrates); it occurs under the influence of microorganisms or the enzymes secreted by them. In the course of fermentation, the energy needed for the vital activity of the microorganisms is released as a result of conjugated oxidation-reduction reactions, and chemical compounds used by the microorganisms for biosynthesis of amino acids, proteins, organic acids, fats, and other body components are formed. At the same time, there is an accumulation of the end products of fermentation. The different types of fermentation include alcoholic, lactic, butyric-acid, propionic-acid, acetone-butyl alcohol, and acetone-ethyl alcohol fermentation. The nature, intensity, and direction of fermentation, as well as the quantitative ratios of the end products, depend on the characteristics of the fermenting agent and upon the conditions under which fermentation takes place (such as the pH, aeration, and the substrate). Alcoholic fermentation. In 1836 the French scientist C. Cagniard de la Tour established that alcoholic fermentation occurs in connection with the growth and numerical increase of yeast. The French chemists A. Lavoisier (1789) and J. Gay-Lussac (1815) gave the chemical equation for alcoholic fermentation: C6H12O6 → 2C2H5OH + 2CO2. In 1857, Louis Pasteur concluded that alcoholic fermentation can be caused only by living yeast under anaerobic conditions. (“Fermentation is life without air.”) On the other hand, the German scientist J. von Liebig stubbornly maintained that fermentation occurs outside the living cell. The Russian physician and biochemist M. M. Manasseina was the first (1871) to point out the possibility of alcoholic fermentation without cells. In 1897 the German chemist E. Buchner, by crushing yeast mixed with quartz sand under great pressure, obtained an acellular liquid that caused the fermentation of sugar, with the formation of alcohol and CO2. When heated to temperatures of 50° C and above, the liquid lost its capability to produce fermentation. All this indicated the fermentative nature of the active component in the yeast juice. The Russian chemist L. A. Ivanov observed (1905) that the addition of phosphates to yeast juice increases the speed of fermentation severalfold. The research of the Russian biochemists A. N. Lebedev, S. P. Kostychev, and Ia. O. Parnas and the German biochemists K. Neuberg, G. Embden, O. Meyerhof, and others confirmed that phosphoric acid is involved in the most impprtant stages of alcoholic fermentation. yields a second molecule of glyceraldehyde phosphate, which is also oxidized to 1,3-diphosphoglycerate. 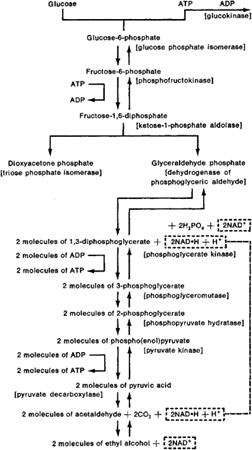 The latter, giving up one phosphoric acid group to ADP (by the action of the enzyme phosphoglycerate kinase), turns into 3-phosphoglycerate, which (by the action of the enzyme phosphoglyceromutase) becomes 2-phosphoglycerate, which in turn is converted to phospho(enol)pyruvic acid by the action of the enzyme phosphopyruvate hydratase. The phospho(enol)pyruvic acid, by the action of pyruvate kinase, transfers a phosphoric acid group to a molecule of ADP, resulting in the formation of a molecule of ATP and a molecule of enolpyruvic acid, which is very unstable and changes to pyruvic acid. This acid, by action of the enzyme pyruvate decarboxylase, which is present in yeast, breaks down into acetaldehyde and carbon dioxide. The acetaldehyde, reacting with the reduced form of nicotinamide adenine dinucleotide (NAD · H) that formed upon oxidation of glyceraldehyde phosphoric acid, changes into ethyl alcohol by the action of the enzyme alcoholdehydrogenase. Thus, upon fermentation of one mole of glucose, two moles of ethyl alcohol and two moles of C02 are formed; in addition, two moles of ATP are formed as a result of phosphorylation of two moles of ADP. Thermodynamic calculations show that during alcoholic fermentation, the conversion of one mole of glucose may be accompanied by a reduction in free energy of about 210 kilojoules (kJ, or 50,000 calories)—in other words, the energy stored in one mole of ethyl alcohol is 210 kJ (50 ,000 cal) less than the energy in one mole of glucose. The formation of one mole of ATP (macroergic—energy-rich—phosphate compounds) consumes 42 kJ (10,000 cal) of energy. Consequently, a significant part of the energy released during alcoholic fermentation is stored in the form of ATP, which supplies various energy needs of the yeast cells. The process of fermentation has the same biological significance in other microorganisms. Upon total combustion of one mole of glucose (with the formation of CO2 and H2O), the change in free energy reaches 2.87 MJ (686,000 cal). In other words, the yeast cell uses only 7 percent of the, energy in the glucose. This shows the low efficiency of anaerobic processes as compared to processes occurring in the presence of oxygen. In the presence of oxygen, alcoholic fermentation is suppressed or ceases, and the yeast receives energy for its vital activity by the process of respiration. A close link is observed between fermentation and the respiration of microorganisms, plants, and animals. The enzymes participating in alcoholic fermentation are also present in the tissues of animals and plants. In many cases, the first stages in the breakdown of sugars, up to the point of formation of pyruvic acid, are the same for both fermentation and respiration. The process of anaerobic decomposition of glucose is also of great importance in muscle contraction; the first stages of that process are also analogous to the initial reactions in alcoholic fermentation. The fermentation of carbohydrates (glucose, fermentative hydrolyzates of starch, acidic hydrolyzates of wood) is used in many branches of industry to obtain ethyl alcohol, glycerol, and other industrial and food products. Wine-making, the brewing of beer, and the preparation of dough in the bread and baked-goods industry are all based on alcoholic fermentation. Heterofermentative bacteria (for example, Bacterium lactis aerogenes) cause fermentation that results in the formation of lactic acid, acetic acid, ethyl alcohol, CO2, and a small quantity of aromatic substances such as diacetyl and esters. In lactic fermentation, the conversion of carbohydrates, especially in the initial stages, is very similar to the reactions in alcoholic fermentation, with the exception of the decarboxylation of pyruvic acid, which is reduced to lactic acid by the addition of hydrogen received from NAD · H. Homofermentative lactic fermentation is used to obtain lactic acid, in the preparation of various sour milk products and bread, and in the ensilage of fodder in agriculture. Heterofermentative lactic fermentation takes place during the process of preserving various fruits and vegetables by fermentation. Butyric-acid fermentation was formerly used to obtain butyric acid from starch. Acetone is formed by the decarboxylation of acetoacetic acid, which is obtained as a result of the condensation of two molecules of acetic acid. The research of V. N Shaposh-nikov in experiments with growing crops has shown that acetone-butyl alcohol fermentation (and a number of other kinds, such as propionic-acid and butyric-acid fermentation), occurs in two stages. In the first stage of fermentation, acetic and butyric acid accumulate parallel to the growth of the biomass; in the second stage, primarily acetone and butyl alcohol are formed. During acetone-butyl alcohol fermentation, monosaccharides, disaccharides, and polysaccharides (starch and insulin) are fermented, but the cellular tissue and hemicellulose are not. Acetone-butyl alcohol fermentation was used industrially to obtain butyl alcohol and acetone, which are used in the chemical and paint and lacquer industries. Fermentation of proteins. Some bacteria of the genus Clostridium (putrescent anaerobes) are able to ferment amino acids as well as carbohydrates. These bacteria are better adapted to utilize proteins, which they break down to amino acids by means of proteolytic enzymes; the amino acids are then fermented. The process of protein fermentation is important in the circulation of matter in nature. Types of fermentation that are accompanied by reduction processes also exist. An example of such “oxidizing” fermentation is citric-acid fermentation. Many mold fungi ferment sugar, resulting in the formation of citric acid. The more active strains of Aspergillus niger convert up to 90 percent of the sugar consumed into citric acid. A considerable part of the citric acid used in the food-processing industry is obtained by microbiological means—the subsurface and surface culturing of mold fungi. By tradition, even purely oxidizing processes caused by microorganisms are occasionally called fermentation. Acetic-acid and gluconic-acid fermentation may serve as examples of such processes. Acetaldehyde is an intermediate compound in the oxidation of alcohol to acetic acid. In addition to oxidizing alcohol to acetic acid, many acetic-acid bacteria also oxidize glucose to gluconic acid and ketogluconic acid. The calcium salt of gluconic acid serves as a good source of calcium for humans and animals. Shaposhnikov, V. N. Tekhnicheskaia mikrobiologiia. Moscow, 1948. Kretovich, V. L. Osnovy biokhimii rastenii, 4th ed. Moscow, 1964. Ferdman, D. L. Biokhimiia. Moscow, 1966. Rabotnova, I. L. Obshchaia mikrobiologiia. Moscow, 1966. An enzymatic transformation of organic substrates, especially carbohydrates, generally accompanied by the evolution of gas; a physiological counterpart of oxidation, permitting certain organisms to live and grow in the absence of air; used in various industrial processes for the manufacture of products such as alcohols, acids, and cheese by the action of yeasts, molds, and bacteria; alcoholic fermentation is the best-known example. Also known as zymosis.